I gave my first resident artist talk at the Penland School of Crafts to an audience of maybe 70 students and instructors in May, 2009. I was incredibly nervous and the talk was only five minutes! My voice was different when I began, it was higher or something. My heart raced and I found myself out of breath even though I was just sitting there. I read from a script, too. When it was over I was relieved and also disappointed. I didn't feel strongly about what I said and it felt like I had missed a chance, albeit brief, to share my work with others. Plus, the talk fell short for the simple, yet complicated reason that I didn't sound like "me." At that moment, I promised myself I would work on this and I would become a better speaker. Over the next three years, I had lots of opportunities to talk about my work to different audiences and for different lengths of time. I made lots of work, too, and honed my aesthetic, my concepts and my understanding of what I was doing… and over time, I became a better speaker. I talked to my audience like I was having a warm, engaging conversation and my personality came through. I stopped using a script or even notes, I learned to manage my nerves, and I became more relaxed. All that practice had helped immensely, not only for the quality of the talk, but also because I was learning to articulate my thoughts simply and clearly. It was exciting for me! Last night I spent a few hours working on my next talk which I will give tomorrow. 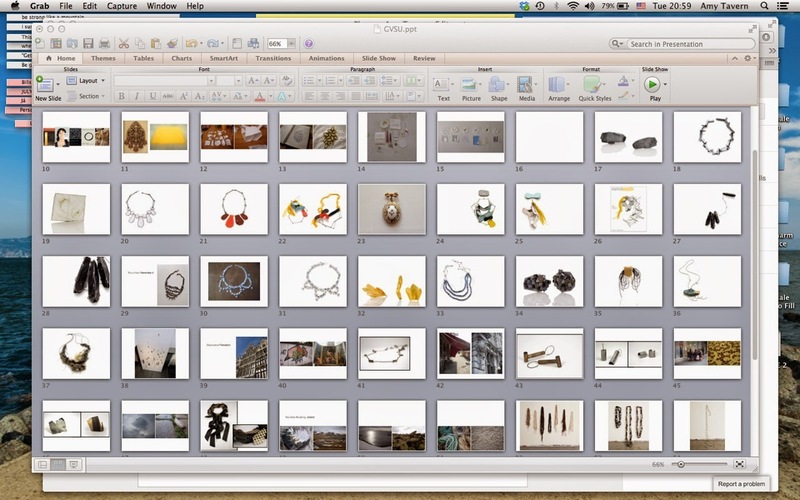 I began by revisiting my last PowerPoint presentation: I moved slides around, I changed images, I edited. I saw things in a new way, too, and made changes that will make the talk richer and more succinct, as well as visually stronger. These lectures are one way for me to share my work and, every time I present it like this, I get to know it a little bit better and I get a little bit better at talking about it, at connecting... and this is even more exciting to me. If you live in the Allendale/Grand Rapids area, please come say hello at my lecture on Thursday, September 25 at 7pm at the GVSU Mary Idema Pew Library 030, Atrium Level. The lecture is free and open to the public.